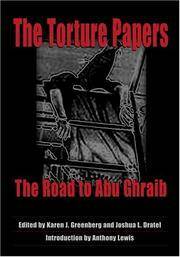 The Torture Papers: The Road to Abu Ghraib. By Greenberg, Karen J. and Dratel, Joshua L -- Editors; Introduction by Anthony Lewis. Cambridge: Cambridge University Press, 2005. First Edition, First Printing Cloth AS NEW in AS NEW DJ 4to (7-1/4 x 10-1/4), 1249 pp including Index and Appendices. Book is FINE -- Unread, Unmarked and AS NEW in AS NEW glossy pictorial DJ. Cover is grey cloth with red inset lettering of title and authors on front cover and spine. (dc) A comprehensive compendium of documents intended to justify (i.e., fabricate) rationales and legalistic justifications for the torture that would take place in Afghanistan, Guantanamo, and Abu Ghraib. Completely destroys the notion that such torture took place only incidentally and on a completely lower level when the Attorney General and others of that rank were actively preparing defenses for such activity. 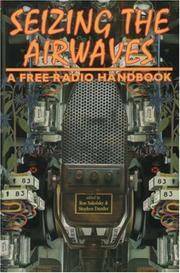 Seizing the Airwaves: A Free Radio Handbook (SIGNED). By Sakolsky, Ron and Dunifer, Stephen - Editors. San Francisco: AK Press, 1998. First Edition Glossy Pictorial Wraps AS NEW in WRAPS 8vo (6 x 9), 217 pp including brief bio's of contributors and several pages describing other AK Press books. Classic of Pirate Radio is AS NEW, paperbound in glossy pictorial wraps, INSCRIBED AND SIGNED on the title page by Stephen Dunifer. Contributors include: Lee Ballinger, Jon Bekken, Stephen Dunifer, Ricardo Omar Ilizalde, Lorenzo Komboa Ervin, Charles Fairchild, Paul W. Griffin, Jerry M. Landay, Robert W. McChesney, Sheila Nopper, Meme Sabon, RonSakolsky, Sal Salerno, DJ Tashtego, plus artists and photographers and the many people interviewed.